Book two in the New York Times and USA Today bestselling Rose Gardner Investigations series. Rose Gardner is trying to build a new normal. One that leaves the Fenton County crime world—including James “Skeeter” Malcom, the current king—behind. Her best friend and roommate is a big part of that effort, but Neely Kate is busy building her own life anew. She disappeared for a few days, scaring the spit out of Rose—which is why Rose finds it impossible to deny her when she suggests they look for a missing parrot. Only this time Neely Kate isn’t interested in the reward money; she’s set them up to work with a cranky private investigator known as Kermit the Hermit. Rose sees it for what it is: another bid for them to become private investigators. If nothing else, it’s a good distraction…until one of James’s nemeses, Buck Reynolds, comes calling for help. James’s brother has gone missing, and Reynolds is number one on the crime king’s suspect list. Only, according to him, he’s innocent. Rose had promised herself she was through with the crime world, but she wants to see his James’s brother safe. Besides, can she really say no when she might be the only one who can keep order in the county? Just WOW! I have a book hangover that is going to last awhile. As always, with any of Denise's books, I was immediately swept into the story and couldn't put it down. It was great to be back in Henryetta with my friends (cause trust me that is what they feel like). I love how Rose has grown and become more confident of herself. She is a far cry from the naïve, timid girl we met in the beginning of the Rose Gardner Series. I went through all of the emotions while reading this book. Still processing things that happened. I'm anxious to find out how what happens next in her life. Waiting for the next book is always torture. I voluntarily reviewed an Advanced Readers Copy of this book. If you read the first in the series and you liked it but not sure you liked it enough to continue with the series, buy this book! As the other reviews state, the series just gets better. Read it , you won't regret it! 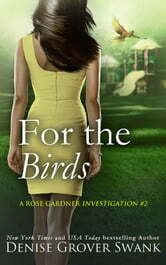 When I pick up a Rose Gardner Book, I never know where she is going to lead us. What starts out as a simple lost bird investigation turns into something so much more. Rose and Neely Kate are very busy girls. They have their landscaping business to attend to with Bruce Wayne. Rose still has the nursery with Violet, and on top of all that, they have decided to do a little PI work. These two work well together and with their different connections, they get answers quicker than others seeking the same thing. Rose has a lot of sole searching in this book. She also makes up for lost time with Neely Kate. There were a few times in the book I wasn't sure what Rose was thinking, and to be honest, I am still trying to reconcile some of her actions. We get to hear from some of our favourite characters too, Joe, Maeve and even Violet is back. Miss Mildred has a part in this latest investigation, which had me giggling. I truly adore this series, and the last one for that matter, and fall into these books with a passion. Rose is one special lady indeed. *I received a copy for an honest review.